The Indiana credit union hit the $1 billion mark this year thanks to a strategy that has created a decade of steady growth in a challenging market. 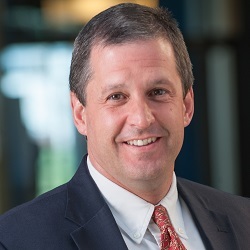 3Rivers FCU ($1.0B, Fort Wayne, IN) has learned to go with the flow, successfully making a mark in its marketplace by being what a lot of the people need most of the time. Cates took the helm of a financial cooperative in a market with flat population growth and stiff competition. And in the midst of the Great Recession. The population still isn’t growing much in and around Fort Wayne, Indiana, but 3Rivers has. Ten years ago, 3Rivers was a $500 million credit union. This year it joined the billion-dollar club. But, membership has grown only 7.52% since 2008, from 70,150 in the second quarter that year to 75,426 as of June 30 this year. So, what’s the story behind 3Rivers’ asset growth? The credit union has focused on a three -pronged strategy of being high-touch, competitively priced, and convenient. As a result, it’s average member relationship has soared more than 66% in the past decade, from $11,335 to $18,884. What is now 3Rivers was founded in 1935 to serve International Harvester employees. It expanded its SEG base in the early 80s when it became Three Rivers FCU. It earned a seven-county community charter in 2005 and now claims a relationship with one in four people in its home base of Fort Wayne and surrounding Allen County. The 83-year-old cooperative is also now the third-largest mortgage lender in its home county and the seventh-largest holder of deposits — the largest credit union player in both those categories. 3Rivers doesn’t strive to have the best rates; however, it stays competitive by providing “Walmart prices and Nordstrom service,” Cates says. To do that, the credit union keeps close tabs on competitors’ lending and savings rates and aims to stay in the middle. That’s the competitive part. The convenience piece doesn’t change that much, Cates says, except for keeping up with digital and mobile changes. The high-touch part is best exemplified in the credit union’s commitment to its branch network. A new branch is under construction, bringing the total to 16 plus nine stand-alone ATMs. The five new branches that have been built or re-built in the past few years each feature teller islands with staff and management sharing a common workroom. The crowning achievement was a new headquarters building, designed with the same concepts in mind. Selecting a new branch location isn't easy, but BranchAnalyzer makes it easier. Analyze competitors, research demographics, and even find closed branches that might be good expansion opportunities. 3Rivers is a community financial institution and works to leverage that advantage. Those ties come with a cost. 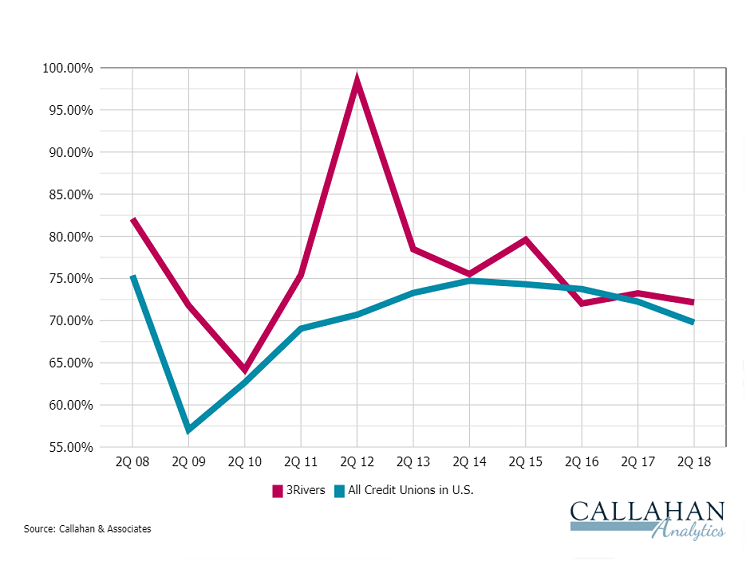 3Rivers has 269 members per FTE, for example, compared with 395 as of June 30, 2018, for credit unions with $1 billion to $10 billion in assets, according to data from Callahan & Associates. And the credit union’s ratio of land and buildings as a percentage of assets is 2.41% compared to its asset-based peer group’s 1.50%. 3Rivers also has had a consistently higher operating expense ratio than the average credit union. 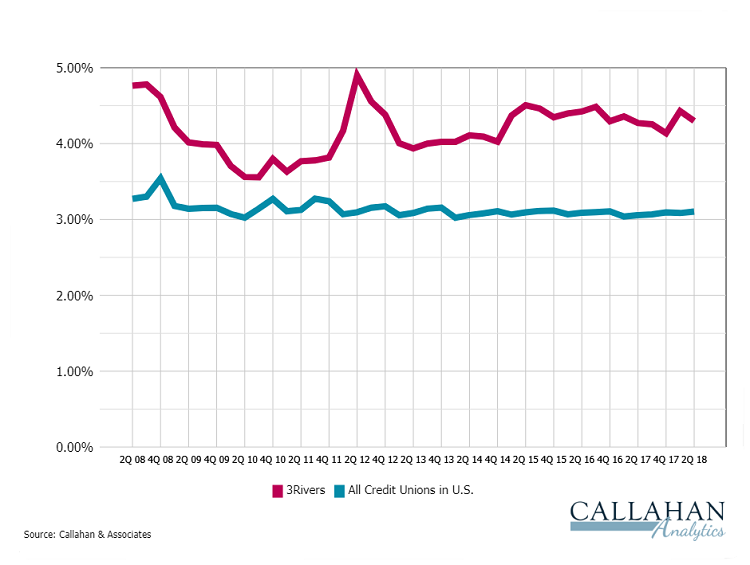 At midyear, it was 4.30% compared to 3.10% for all U.S. credit unions. 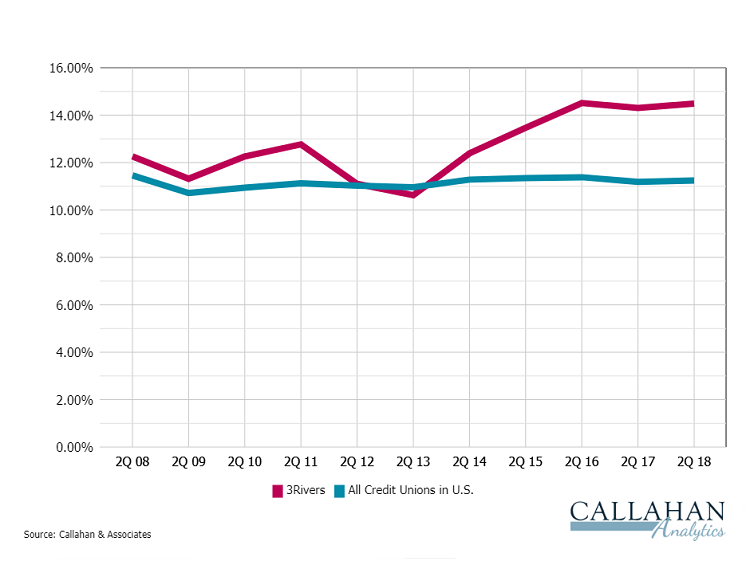 At the same time, the credit union’s ROA was 1.43% in the second quarter, well above the industry average of 0.90 for all U.S. credit unions , and its capital ratio at June 30 was 14.49%, also well above the industry average of 11.24%. Ten years ago, 3Rivers had slightly more than $500 million in assets. Today, it has passed the billion-dollar mark. Ten years ago, 3Rivers had 70,150 members. In the second quarter of 2018, the member count was 75,426. 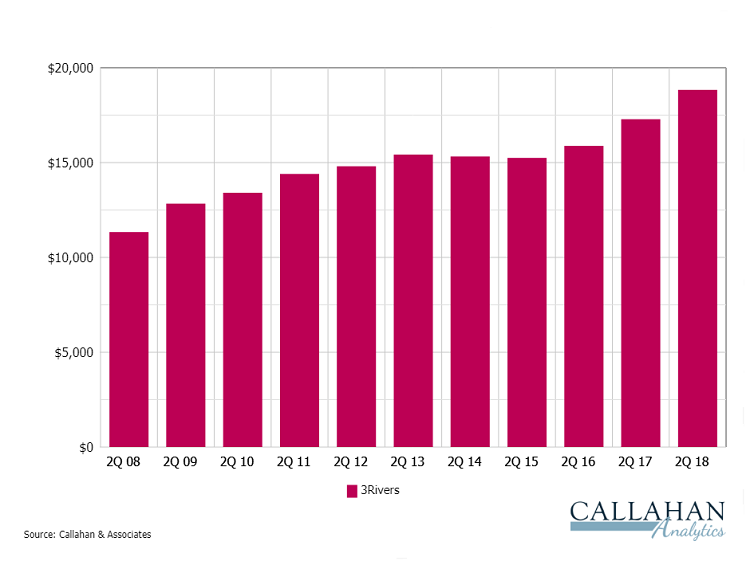 The average member relationship at 3Rivers has risen 66.18% from the second quarter of 2008 to the second quarter of 2018, according to data from Callahan & Associates. 3Rivers has had a consistently higher operating expense ratio than the average credit union. It was 4.30% at midyear, compared with 3.10% for all U.S. credit unions. Branch and headquarters construction created the spike in 2012. 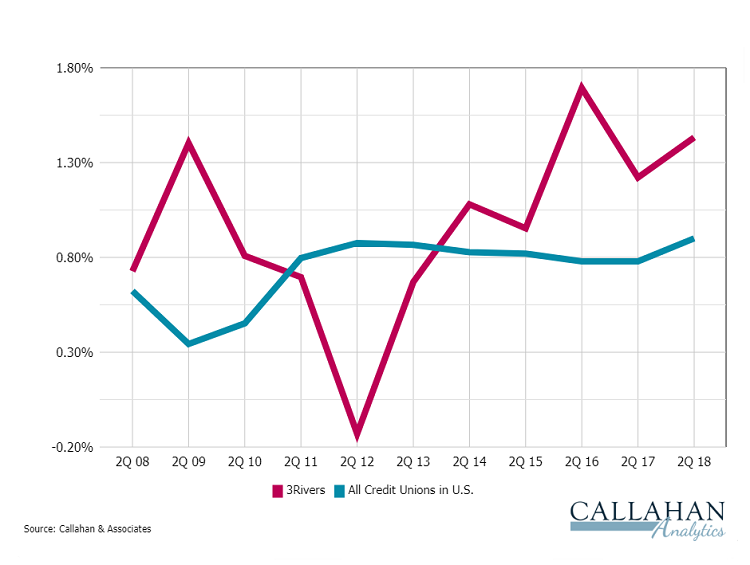 The credit union has consistently been well capitalized since the recession. It’s capital ratio was 14.49% at midyear. That’s a full 325 basis points higher than the average U.S. credit union’s 11.24%. Productivity and growing member engagement has helped 3Rivers maintain a solid efficiency ratio as it invests heavily in its branching network and other expensive commitments to member service. 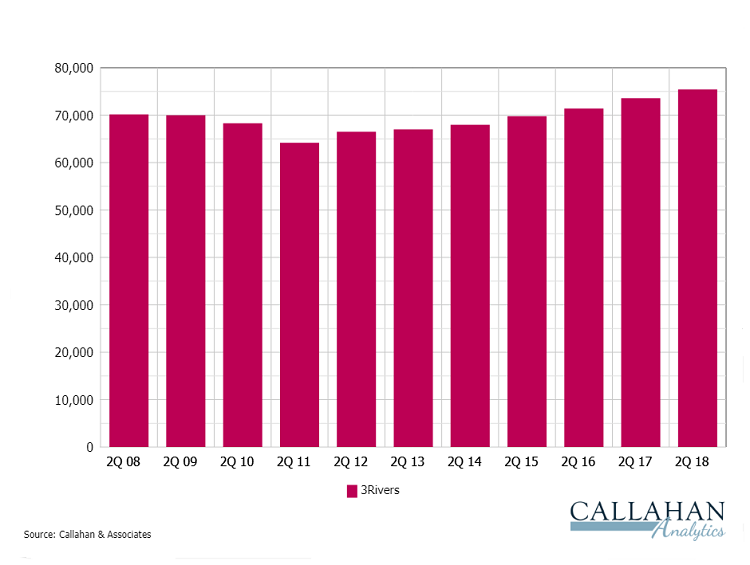 3Rivers returned 1.43% on its assets in the second quarter of 2018, continuing to perform well above the industry average in this key performance indicator. 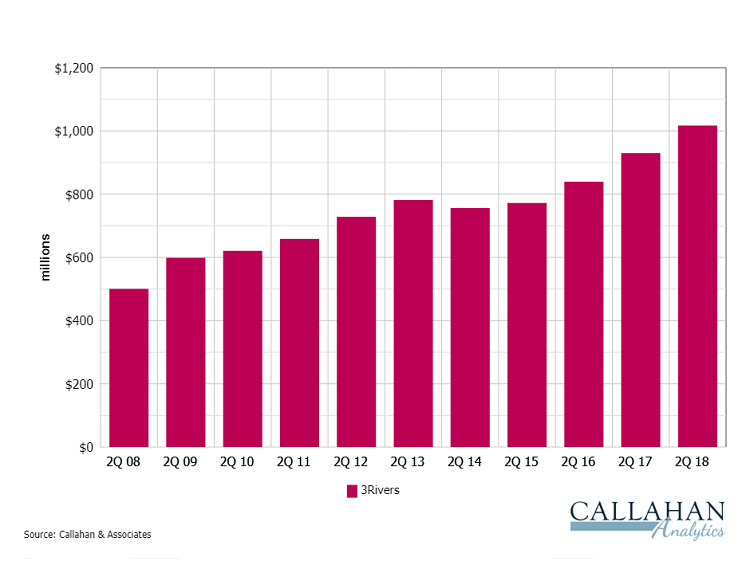 Cates’ shop also is growing loans and shares at or above industry averages and has for years. Its loan-to-share ratio right now is higher than 100%. Its high capital ratio and investment portfolio is allowing 3Rivers to find funding to keep the lending machine going. And that’s all part of keeping the engagement going, of maintaining consistency, and of continuing the success the credit union has steadily built.